Illuminated water jets that appear out of nowhere, luminous, leaping fountains with ever changing patterns. These are the water entertainment artists for your garden. Incredibly easy to install, they they creat a living stage for your garden. You do not even need a pond to install these water entertainment products. Depending on which entertainment fountain you choose, a discrete architectural pool or a water reservoir with a cover and gravel is all that is required. And whats more the supplied remote control allows easy and convenient selection of the various permanently stored programs ..its simply "plug and spray". Give your fantasy free rein with this individually configurable fountain. The five individual pumps can be setup in a wide variety of configurations. 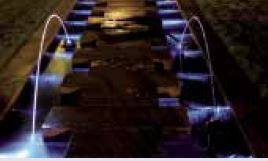 Each pump spray is individually activated and illuminated via a remote control so that the fountain height and light intensity can varied. These water effects with three or five individually adjustable nozzles satisfy the most demanding requirements. Fountain heights between 30cm (1 foot) and 140 cm (4.6 feet) are adjustable with the supplied remote control via selection of the permanently set programs. The light intensity of the high-quality LED rings varies depending on fountain height. 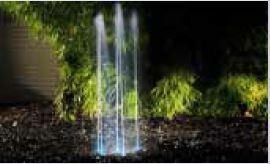 The water jets glow in a wide variety of colours as the water arcs through the air in a perfect laminar jet. The jet length and height can vary, the random program »random play« shows all the settings in changing colours or you can choose from a wide variety of pre-programed water display. Energy-efficient 12 V technology and fast installation are other standout features of this product. 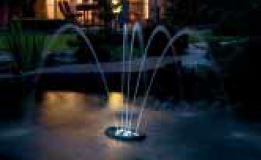 Floating on the water surface, or placed on the ground, this compact fountain is quickly installed. The five nozzles each have a LED illuminated rings can be aligned individually and present different water patterns. The pumps and light elements run on energy-efficient 12 V technology. 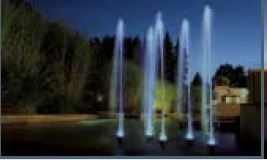 This floating fountain display automatically runs through a pre-programed loop of different water displays.